If you would like to upgrade your current CAST configuration to add the following capabilities, please let us know how we can assist you. 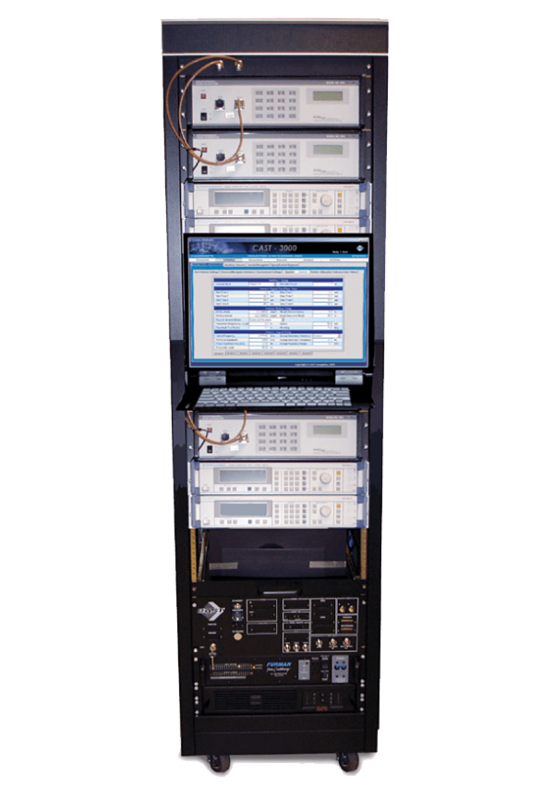 The CAST interference generation system provides repeatable support for testing anti-jam performance of GPS receivers. The system enables the user to specify jamming levels and signal transmission characteristics for broadband and narrowband jammers. The CAST interference generation system may be operated in standalone mode or may be used as a supplement to a CAST simulator. When augmenting a CAST simulator with the interference generator option, the user may emulate jamming threats that occur in hostile environments using their simulator inside a chamber or test laboratory. The system maintains up to eight independently controlled jamming signals – each assigned a unique speed, altitude, and trajectory profile. Modulation types on the interfering signal can be commanded dynamically. Narrowband operating modes include Continuous Wave, Pulsed Continuous Wave, Swept Continuous Wave, FM Noise, Pulsed FM Noise, and Wideband Noise.